Given by the sitter to her son, Lorenzo Lewis [1803-1847], Audley, Clarke County, Virginia; his widow, Esther Maria Coxe Lewis [1804-1885], Clarke County, Virginia; their son, Edward Parke Custis Lewis [1837-1892], Hoboken, New Jersey; his son, Edwin Augustus Stevens Lewis [1870-1906], Hoboken, New Jersey; his widow, Alice Stuart Walker Lewis [1877-1973], Hoboken, New Jersey; their son, H. H. Walker Lewis [b. 1904], Baltimore; gift 1974 to NGA. An inscription in ink on the stretcher reads: "L. Lewis." A second reads: "For Lorenzo Lewis given by his Mother 1836." His dates and those of his wife and their descendants are found in Burke's Presidential Families of the United States of America, 2nd ed., London, 1981, 21-22. H. H. Walker Lewis to William P. Campbell, 29 November 1974, with a memo dated 28 November 1974 (NGA curatorial file). "Lorenzo left his household furnishings . . . for the use of his widow for life, thereafter to be divided among his six sons in equal shares. Esther Maria died in 1885, and in the autumn of 1888 the portraits were divided by drawing lots . . . we know of the disposition of the Nelly Custis portrait from a letter written to his wife by Edward Parke Custis Lewis, who was then Minister to Portugal: `Dear Mary . . . American mail just in & a letter from Dainger in which he tells me that I have drawn the Nellie Custis picture by Stuart . . . Yr. affect husband E.P.C.L.'" On Mrs. Lewis' death, 22 November 1973, the painting went to her son H. H. Walker Lewis as "remainderman" under his father's will; memo of 28 November 1974 from Lewis to Campbell. Jefferson's America & Napoleon's France: An Exhibition for the Louisiana Purchase Bicentennial, New Orleans Museum of Art, 2003, no. 143, repro. Stuart, Jane. "The Stuart Portraits of Washington." Scribner's Monthly 12, no. 3 (July 1876): 371-373. Mason, George C. The Life and Works of Gilbert Stuart. New York, 1879: 27, 214. "Portraits Painted by Stuart...taken from Mason's Life and Works of Gilbert Stuart." 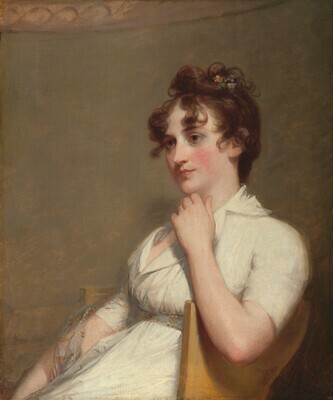 In Exhibition of Portraits Painted by Gilbert Stuart. Exh. cat. Museum of Fine Arts, Boston, 1880: 46, no. 367. Bowen, Clarence W., ed. The History of the Centennial Celebration of the Inauguration of George Washington. New York, 1892: 145, no. 142, repro. opp. 256, 441. Park 1926, 294, 476-477, no. 491, 901. Mount, Charles Merrill. "Gilbert Stuart in Washington; with a Catalogue of His Portraits Painted between December 1803 and July 1805." Records of the Columbia Historical Society of Washington, D.C. 48 (1973): 106. Walker, John. National Gallery of Art, Washington. New York, 1975: 382-383, color repro. American Paintings: An Illustrated Catalogue. National Gallery of Art, Washington, 1980: 231, repro. Williams, William James. A Heritage of American Paintings from the National Gallery of Art. New York, 1981: 67, repro. 68, 72. Walker, John. National Gallery of Art, Washington. Rev. ed. New York, 1984: 378, no. 536, color repro., as Mrs. Lawrence Lewis. Brady, Patricia, ed. George Washington's Beautiful Nelly; The Letters of Eleanor Parke Custis Lewis to Elizabeth Bordley Gibson, 1794-1851. Columbia, South Carolina, 1991: 260-261. American Paintings: An Illustrated Catalogue. National Gallery of Art, Washington, 1992: 353, repro. Miles, Ellen G. American Paintings of the Eighteenth Century. The Collections of the National Gallery of Art Systematic Catalogue. Washington, D.C., 1995: 237-240, color repro. 239.